DAYTONA BEACH, Fla. (Feb 8, 2018) — Auburn University student and Alabama native Bret Holmes is set to take the green flag on the 2018 ARCA Racing Series Presented by Menards season this Saturday at Daytona International Speedway in what looks to be a fresh start for the team after a season of inconsistencies in 2017. Holmes, who will be the first to admit that last season had its share of growing pains, feels much more confident in the potential of this year’s campaign after a host of changes that include the addition of new team members and a retro-style logo that is sure to make waves in and around the series this season. Stacy Holmes, who owns Holmes II Excavation in their hometown of Munford, Ala., has been instrumental in the development of his son’s racing career and indeed has doubled down on his efforts to put a winning piece of equipment on the track. In 2017, Holmes competed in all 20 ARCA races finishing 6th in the driver championship standings, third in the SCOTT rookie standings. He had 12 top-10’s and 2 top 5’s. Other signs of change to the 2018 campaign for BHR (Bret Holmes Racing) include a new logo and paint scheme to the No. 23 Holmes II Excavation Chevrolet. 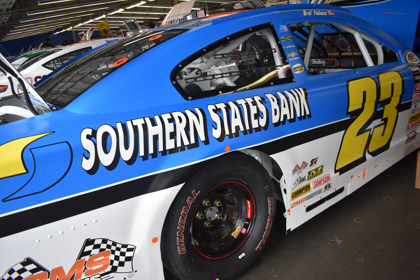 Instead of the yellow and blue scheme that has been a staple of the team since its inception in 2016, the colors will now be blue and white that mix well together with associate sponsors like Southern States Bank and Champion Power Equipment. One other note to take home before the start of the Lucas Oil 200 was a tragic incident that took place at the BHR shop in Statesville, N.C. in the buildup to this race. Crew member Ben Leslie was injured in a shop fire that left him hospitalized from burns. BHR is happy to report that Ben is doing well and is back at his home in North Carolina. 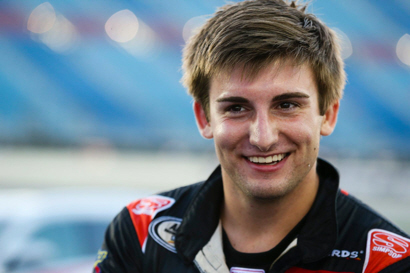 He is expected to return to the team before the next race at Fairgrounds Speedway Nashville on April 7th. The No. 23 will adorn a special decal this weekend wishing Ben a speedy recovery. With all the hope and promise of a new season beginning this weekend in Daytona, Holmes and his father know that this year’s ARCA field will not just willingly give BHR a free pass to dominate the series. With superstars in the making all throughout the starting grid, this year will be another tall task, but one that the now veteran team is willing to take on with just a little more grit and expertise than before. The Lucas Oil 200 Driven by General Tire is the first of 20 races on the 2018 ARCA Racing Series presented by Menards schedule. Practice begins Thurs., Feb. 8 from 4 – 6 p.m. ET. Final practice is Friday morning, Feb. 9 from 9:30 a.m. – 10:30 a.m., followed by group qualifying at 3:30 p.m. Friday afternoon. The Lucas Oil 200, which begins the 66th consecutive season for ARCA, is set to get the green flag at about 4:50 p.m. ET Saturday, Feb. 10. The race is live on FS1 beginning at 4:30. ARCAracing.com will stream live timing and scoring and chat throughout the entire weekend. About Bret Holmes Racing: Bret Holmes Racing is an Alabama-based ARCA racing team that operates out of Munford, AL and Statesville, N.C. while still holding true to its traditional southern roots. Founded by Stacy Holmes, of Holmes II Excavation in Munford, the team sticks to its good nature and solid values to put the best product on and off the track with its driver Bret Holmes.